Dreyfus Affair - The Dreyfus affair was a notorious incident of public and official anti-Semitism in late 19th Century France. Alfred Dreyfus, a high ranking Jewish officer in the French army was falsely accused of treason and railroaded into exile and disgrace. To many Jews, the affair indicated that despite the promises of "equality" and "progress," it was impossible for Jews to truly assimilate into European society. It inspired the Zionist program of Theodor Herzl. The ultimate exoneration of Dreyfus, due to the courageous efforts of author Emile Zola and others, could be variously interpreted as a victory for those who had faith in the promises of liberal democracy, or as a bit of luck that saved an individual in the face of contrary historical trends. Dreyfus was born in in Mulhouse (Mülhausen) in Alsace on October 9, 1859. The family had long been established in the traditionally German-speaking area, which had once belonged to Germany. Alfred Dreyfus and his family had a proven record of French patriotism. Dreyfus was motivated to choose a military career when the Prussians conquered Alsace in 1871. After the Prussian takeover, his family fled to Paris, opting for French nationality. He graduated from the elite École Polytechnique military school in Paris, as a sub-lieutenant in 1880. From 1880 to 1882 he was trained as an artillery offer in the artillery school at Fontainebleau. On graduation he was assigned to the first division of the 32nd Cavalry Regiment and then promoted to lieutenant in 1885. An officer of evident ability, he was made adjutant to the director of the Établissement de Bourges, a government arsenal, and promoted to captain. In 1891, three days after his marriage, Dreyfus was admitted to the École Supérieure de Guerre (War College). In 1893, Dreyfus graduated ninth in his class with honorable mention. This, despite the fact that one of the examiners, General Bonnefond, stated that "Jews were not desired" on the staff, and gave Dreyfus poor marks. The racially motivated tampering with his grades elicited a protest, which was later used against him. Dreyfus was nonetheless immediately assigned as a trainee in the prestigious General Staff headquarters, the only Jewish officer there. During this period, there was extensive anti-Semitic agitation in French society, despite the formal legal equality of citizens granted by French law. France's defeat in the Franco-Prussian war and the inevitable competition of Jews and non-Jews for high office and in business, had generated the expected sort of ultra-nationalist and anti-Semitic sentiment. In the 1880s chauvinist demagogues such as Georges Boulanger, Edouard Drumont, founder of the Antisemitic League of France and Paul Déroulède founder of Ligue des Patriotes, stirred up fervor for a "unified Catholic France." The newspaper "La Libre Parole" an anti-Semitic publication, printed a series of defamatory articles titled "Les Juifs dans l'Armée" ("Jews in the Army"). Jewish officers including Cremieu-Foa and Captain Mayer had challenged the authors of these defamations to duels. 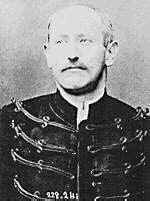 Captain Mayer died in a duel against Marquis de Mores in June 1892, creating a scandal before the Dreyfus Affair. It should be emphasized that the French government and the French army as institutions were probably not anti-Semitic. Birnbaum (Birnbaum, Pierre, L'Affair Dreyfus: La Republique en Peril, Gallimard, Paris, 1994) counts about 250 French officers "of Jewish descent" in this period, including many who pursued normal careers and served with distinction. However, during this period, and later, a significant proportion of individuals in the government and the army were anti-Semitic, or were willing to use anti-Semitism as a political issue. This became apparent during the premiereship of Leon Blum as well, and thereafter. disgraced after conviction for treason. In 1894, a serious leak was revealed in French Military Intelligence. According to Lieutenant Colonel Sandherr of the innocuously named "Section de Statistique" (statistical section) - actually French counter-intelligence, a French spy had found a discarded message, a "list" called le Bordereau," with secret French artillery information in the waste basket of a German military attache in the Paris embassy. Suspicion was directed at Dreyfus, in part perhaps because of deliberate efforts to convict him and in part because of anti-Semitism. The list was supposedly in a handwriting that resembled that of Dreyfus, and Dreyfus had made yearly trips to visit his relatives in German occupied Mulhaussen. Dreyfus was arrested on October 15, 1894. On January 5, 1895, Dreyfus was convicted in a secret court martial, publicly stripped of his army rank, and sentenced to life imprisonment on Devil's Island in French Guiana. The court martial violated procedures in many respects and was highly "irregular." The affair became a platform for anti-Semitic agitation, with excited mobs screaming "Death to the Jews." It was later shown the Lieutenant Colonel Sandherr and his associates were active in forging evidence against Dreyfus, encouraged by General Auguste Mercier, who was Minister of War. In August 1896 the new chief of French military intelligence, Lt Colonel Picquart, himself apparently an anti-Semite, nonetheless reported that he had found evidence that the real traitor was Major Ferdinand Walsin Esterhazy. Picquart was transferred in November 1896 to the Sahara desert in the south of Tunisia, in order to silence him. Reports of an army cover-up and Dreyfus's possible innocence were leaked to the press. Several people began a fierce agitation for his exoneration, in addition to Picquard. They included Dreyfus's brother Mathieu, Jewish journalist and anarchist Bernard Lazare, who first used the phrase J'accuse in L�Eclair, on 15 September 1896. The article was also published under the title The Dreyfus Affair � A Miscarriage of Justice, in Belgium in November 1896. Additionally, Dreyfus was supported by a fellow Alsatian, the vice-president of the French Senate, Auguste Scheurer-Kestner. By 1898, the cause had attracted the attention of celebrities such as Anatole France, Emile Zola, and Georges Clemenceau. Zola wrote a famous open letter to French President Félix Faure. Clemenceau published this letter in the first issue of l'Aurore, and affixed to it the famous headline, "J'Accuse!" Zola's letter was intentionally inflammatory. He wanted to be tried for libel. He was tried and unfortunately convicted. He appealed, but fled to England on the advice of lawyers. But the machinery had been set in motion. "I Accuse...! Letter to the President of the Republic by Emile Zola"
On 19 September, 1899, Dreyfus was pardoned by President Émile Loubet and allowed to return from solitary confinement in Devil's Island. He went to live with one of his sisters at Carpentras, and then moved to Cologny. However, the army was slow to admit its mistake. On July 12 1906, Dreyfus was finally officially exonerated by a military commission. The following day, he was readmitted into the army with the rank of Major. He was then made a Knight of the Legion of Honor, and subsequently assigned to command an artillery unit at Vincennes and later moved to Saint-Denis. However, his time in Devil's Island had taken its toll, and Dreyfus was granted early retirement in October 1907. Dreyfus attended the ceremony moving Émile Zola's ashes to the Panthéon in 1908, and there he was wounded in the arm by a gunshot from Louis Gregori, a disgruntled journalist. During World War I, Dreyfus came out of retirement and volunteered to serve as a lieutenant-colonel. Though past retirement age, Dreyfus served in the front-line in 1917, Finally, Lt Colonel Dreyfus was granted the rank of Officer of the Legion of Honor in November 1918. Dreyfus died in Paris aged 75, on 12 July 1935, on the 29th anniversary of his official exoneration. Two days later, his funeral cortège passed the Place de la Concorde through the ranks of troops assembled for Bastille Day. He was interred in the Cimetière du Montparnasse, Paris. The Dreyfus affair was not fully retired in France for many years, and perhaps the embers are still alive even today. The "anti-Dreyfusards" formed the nucleus of the French right wing, and were part of the collaborationist Vichy government. 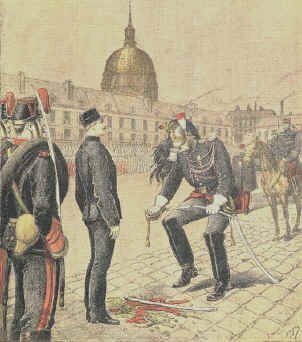 The French military establishment never fully came to terms with the consequences of the Dreyfus affair. In 1985, President François Mitterrand commissioned a statue of Dreyfus for the École Militaire, but the Minister of Defense refused to display it, though Dreyfus had been exonerated in 1906 and rehabilitated. A curious epilogue to the story is being written by speculation that the "leak" itself was perhaps an elaborate plant by the French. The famous "bordereaux" offered Germans information on French 120 mm Baquet Howitzers. But this particular artillery piece was notably unsuccessful and was already being phased out in 1893. It was eventually replaced by the later famous French 75s. Esterhazy, it is argued, planted the information in order to throw the Germans off the scent of the 75s, and Dreyfus was accused in order to lend credibility to the idea that a Jewish traitor had provided genuine information to the Germans, playing on German anti-Semitism. There is no way to determine if this is a veridical rendition of the facts or an attempt to whitewash Esterhazy and the army. What is certain is that Sandherr and others fabricated evidence to convict an innocent officer, and that the anti-Dreyfus sentiment, and the attempts to clear Esterhazy and Sandherr persisted for many years with no justification.